In 1768 the Swedish shipbuilder Fredrik Henrik af Chapman published his famous "Architectura Navalis Mercatoria" with drawings of many ships. The book holds 62 original plans and comments on ship building and theoretical considerations of that time. It was one of the first works with systematic description of naval architecture and exact drawings of hull lines and sail plans. Chapman's plate XXXI shows the hull lines of a privateer frigate, plate XXXII has the vertical and horizontal cuts and drawings of the interior. The excellent documentation and the elegance of the ship were incentive for building beautiful models, like this one with full sails. This model was built as ship in construction or repair, only partly planked, on a building slip. The method of launching the ship is the English which hardly differed from the Swedish one, and which Chapman showed in his plate LXI. The two plates XXXI and XXXII and the part of plate LXI that shows the English launching method are given here. Chapman's "Architectura Navalis" is valued as reference for shipbuilding at that time. The model is fully planked on port side. On starboard side the frames are shown, and behind them the interior planking. There are several views of the entire model from above, taken from all directions, and some more views from the side. There are several close-up pictures of details of hull and deck. Click images to enlarge! The model was built in all of its interior and the timberwork like a real ship. Every frame consists of two layers that are made of eight or nine pieces each. The launching cradle on the slipway is movable, the model is held by the poppets built at bow and stern. Many parts of the model can be taken out to allow for a view into the interior. 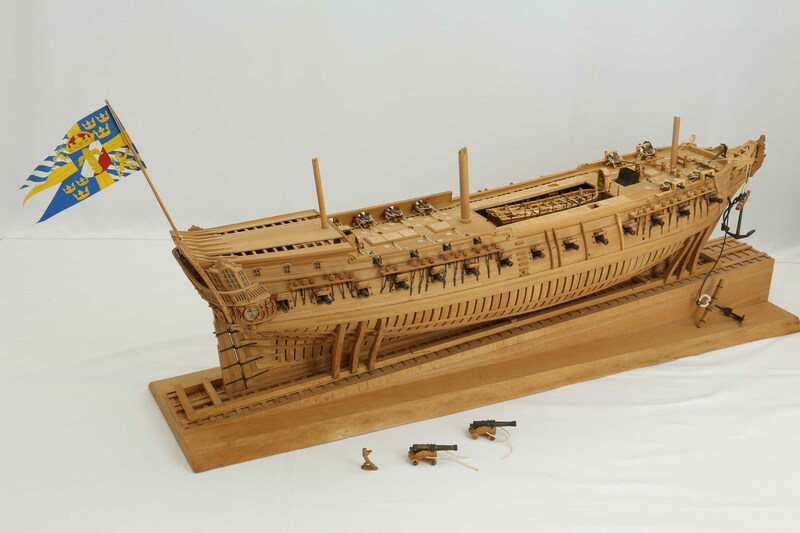 With the model are two separate guns and a sailor, carved from wood, in scale. The boat in the hold is held by two elastic straps with hooks. It can be taken out easily and one can have a view of the gun deck. The gun deck is fully furnished. The details of the gun carriages can be seen, when a small light is used. The gratings of the hold can be removed and allow a view into the deck below the hold with the cables. The aft capstan is below deck, fully built and can been seen when the gratings are taken out. The cabins at stern hold furniture that can be seen through the windows and the left-out planking. The small light helps, but still it is difficult to take pictures of the interior. On starboard side the window can be taken out to have a look into the gun deck. Photos of various stages of construction are available. This model of the privateer frigate is a masterpiece that was made with great care and much love to details. It was built by Otto Fröhlich, Cologne, Germany, who for many years had been secretary of the Arbeitskreis historischer Schiffbau. The model is 1 : 50 scale. Length is 115 cm (133 cm including flag), width 30 cm, height 40 cm (52 cm including flagpole). The model can be taken out from the slipway, e.g. for transport. The price of the model is 7900 Euro, plus transport cost.